As a displaced person came to London and luckily became a wealthy merchant named Hubbarth Hastings, but all have to lose fall in love to the mysterious, noble dynasty's beautiful lady Blanush. He ran away in Tavantinusu (Peru) and discover himself as "sea-god" and there meet with Quiller, love again became in life but the fire of rebellion Separated them. Read the full story from pdf file. 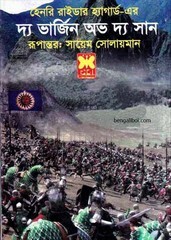 The ebook written by Henry Rider Haggard and translated into Bangla by Sayem Solayoman. This is an another fascinating novel by Haggard. Another unique story of human helpless surrender to the destiny. The pdf has 403 pages.